La Santé Prison (literally meaning Prison of the Health) (French: Maison d'arrêt de la Santé or Prison de la Santé) is a prison operated by the French Prison Service of the Ministry of Justice located in the east of the Montparnasse district of the 14th arrondissement in Paris, France at 42 Rue de la Santé. It is one of the most infamous prisons in France, with both VIP and high security wings. 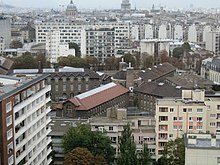 Along with the Fleury-Mérogis Prison (Europe's largest prison) and the Fresnes Prison, both located in the southern suburbs, La Santé is one of the three main prisons of the Paris area. The architect Joseph Auguste Émile Vaudremer built the prison, which was inaugurated on 20 August 1867. The prison is located on the site of a former "Coal market" and replaced the Madelonnettes Convent in the 3rd Arrondissement which had been used as a prison since the Revolution . Previously, on the same site, was a "maison de la santé" (House of health), built on the orders of Anne of Austria and transferred in 1651 to what is now the Sainte-Anne Hospital (in the south). Initially, there were 500 cells which was increased to 1,000 in 1900 following the closure of the Paris Grande Roquette prison in 1899. The cells are 4 metres long, 2.5m wide and 3m high. The prison has a total capacity of up to 2,000 prisoners divided into 14 divisions. In 1899, following the closure and demolition of the Grande Roquette prison the convicts were transferred to La Santé to await transfer to prison in Guyana or execution. Executions were previously done at the entrance to the Grande Roquette so it was decided to do the same (or almost) at La Santé. The guillotine was erected at the corner of the Rue de la Santé and the Boulevard Arago on the pavement. The first execution – and the first in Paris for ten years – took place on 6 August 1909. It was that of a parricide called Georges Duchemin. On 7 May 1932 Eugene Boyer, a 27-year-old criminal who was denied a presidential pardon the previous day by President Paul Doumer, was to be executed. He was saved from the guillotine "in extremis" (twenty minutes before) following the assassination of the Chief of State on the same day as the execution was scheduled: in France, the president could reverse his decision until the last moment and obviously Boyer could not benefit from this potential "ultimate mercy". He was finally pardoned by Albert Lebrun on 13 May – which respected the tradition of pardoning those sentenced to death the first time in the presidential office – and he was sent to prison in Guyana. He was called André Baillard in the book by Henri Charrière. Nearly forty prisoners ended their days in this place. It was also at this site that the second-last public execution in France was held: the burglar and double murderer Max Bloch on 2 June 1939. Fifteen days later on 17 June Eugen Weidmann, guilty of six murders, was guillotined in front of Versailles prison and on 24 June the decision was made to ban public executions. In the same decision the death penalty was made dependent on the Court of Appeal of Seine (either Seine-et-Oise or Aube) then the prisoners had to undergo their execution inside La Santé Prison. On 15 March 1940 the Vocoret brothers, who killed three policemen in Issy-les-Moulineaux, were the first criminals to be guillotined inside the prison. During the Occupation besides common law criminals there were also executions of 18 Resistance fighters and communists. Nine of them, carried out between August 1941 and July 1942, were guillotined. The other nine were shot on 30 April 1944. A plaque affixed to the wall of the prison at the corner of Rue Jean-Dolent and Rue de la La Santé recalls their tragic end. Plaque in memory of the 18 resistance fighters executed here. After Liberation only common criminals were executed in the courtyard of the prison (except for several FLN activists between 1958 and 1960). Those executed included Marcel Petiot in 1946, Marquis Alain de Bernardy de Sigoyer in 1947, Emile Buisson ("Public Enemy No. 1") in 1956, Jacques Fesch in 1957, and Georges Rapin, called "Mr. Bill" in 1960. The last sentences of death by guillotine at La Santé were Roger Bontems and Claude Buffet. They were the authors of an escape attempt with hostage taking which ended with the death of the hostages in 1971. Sentenced to death at Troyes on 29 June 1972, they were executed on the following 28 November. According to them, those sentenced to death from Île-de-France were locked in Fresnes Prison (which theoretically would, in 1978, become the only prison entitled to host executions) but neither were executed – the abolition of the death penalty having been decided in the meantime. Nevertheless, it is in Fresnes prison – in the basement of the National Centre for Guidance – that the remaining two guillotines in France are stored. One of the peculiarities of la Santé today is that, until 2000, inmates were divided by geographic origin and ethnicity within the prison. One group of prisoners (those who are studying in particular) are grouped into sections but most of them are scattered in blocks which are four in number: Block A: Western Europe Block B: Black Africa Block C: North Africa Block D: rest of the world. These blocks have recently undergone substantial renovations. The prison was partially closed from 2014 until 2019 in order to be rehabilitated; the parole section, however, will be kept in operation during this time. La Santé Prison is, nowadays, the last intra-muros prison in Paris. 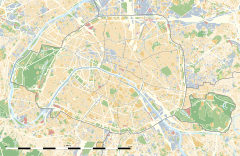 The other large prisons (in all categories) dependent on Paris are Poissy, Fleury-Mérogis, Fresnes, and Melun. Main entrance of the Prison at 42 rue de la Santé. North face of the La Santé Prison, taken from Boulevard Arago. The imprisonment of convicted "personalities" is one of the features of La Santé Prison. The area where these people are imprisoned is called the "special area" by the administration. The visiting rooms for these prisoners are at 1 rue Messier as for other prisoners (where is nearby accommodation for visiting relatives). The film Quartier V.I.P. area partly takes place there. Mourad Dhina – Algerian Politician, imprisoned from 16 January to 4 July 2012. 1927: Léon Daudet escaped 13 days after his imprisonment with Joseph Delest with a false order of release given to the prison director. 8 May 1978: Jacques Mesrine, François Besse, and Carman Rives (who was killed during the escape). May 1986: Michel Vaujour escaped in a helicopter piloted by his wife at the time, Nadine Vaujour. These are the only known escapes from this prison. In front of the exit of the prison there was a cafe called À la bonne Santé (In good health). Relatives of the prisoners would meet there with released prisoners. Scenes from several films took place and were filmed there. The cafe closed in 1980. Currently the premises are used by the prison administration. Arsène Lupin, a fictional character by Maurice Leblanc, was taken prisoner at La Santé prison in the novel 813 (1910). La Santé Prison was the supposed scene of the film Le Trou (The Hole) (1960), directed by Jacques Becker. During preparations for the escape of prisoners through the sewers the street names can be seen on signs in the sewers and there is an exterior view of the prison at the corner of the Boulevard Arago and Rue de la Santé. In the song "L'argent ne fait pas le bonheur" (Money does not buy happiness) (1966) from the group Les Parisiennes: "Take all your [clothes] gaily under your arm and leave without paying / We will bring you oranges at La Santé". Georges Brassens evokes La Santé Prison in his song La femme d'Hector (Hector's wife): "When one takes us by hand / god darned good in a bag / And one sends us to plant / Cabbages at La Santé" as well as his song Le mauvais sujet repenti (The evil-doer repents): "After a century, was thrown / At the door of La Santé". Yves Duteil evokes empathy of a passer-by for the prisoners of La Santé in his song Le mur de la prison d'en face (The prison wall opposite). In the episode Broken Wing  of U.S. television drama 'Leverage', Parker served an unknown amount of time in La Sante. Afterwards, she declared that the best meal she ever ate was in that prison and that she didn't serve as long as they thought she would there. The novel "A Cold Death" by Michael Mandaville uses La Santé Prison to show the attempted assassination of Maurice Papon. In Georges Simenon's Maigret series novel "A Man's Head", La Sante Prison features heavily in the opening chapter. ^ La Santé - Penitentiary - Prison, Ministry of Justice. Retrieved on 18 October 2010. "The Prison of Paris built by the Architect Vaudremer was opened on 20 August 1867, Rue de la Santé"
^ André Manaranche, Jacques Fesch: of nonsense to tenderness Page 308: Letter and testimony of Mr. Mariani, director of the Prison of La Sante from 1954 to 1960, about the prisoner Jacques Fesch: "... Jacques was executed on 1 October 1957: I can say that in the last moments of his life, he has shown tremendous courage and a big adjustment vis-à-vis the people forced to attend the execution; I remember he wanted to express his appreciation to Mr. Baudot, to Father Devoyod, and myself. (...)"
^ a b Davies, Lizzie. "Manuel Noriega, former ruler of Panama, sent to jail by French judge." The Guardian. Tuesday 27 April 2010. Retrieved on 21 May 2010. "Ilich Ramírez Sánchez, the Venezuelan terrorist better known as Carlos the Jackal, is currently serving a life sentence there.."
^ Souchard, Pierre-Antoine. "French court to decide about Noriega's detention." Associated Press. 5 May 2010. Retrieved on 6 May 2010. ^ a b Souchard, Pierre-Antoine. "Panama's ex-dictator Noriega jailed in France." Associated Press. Tuesday 27 April 2010. Retrieved on 20 May 2010. Wikimedia Commons has media related to Prison de la Santé.